DETROIT – Mike ‘Doc’ Emrick, who is synonymous with hockey broadcasting, will reach another milestone on Monday when he calls his 3,000th professional men’s hockey game on Versus when the Red Wings host Pittsburgh at Joe Louis Arena. As a Michigander, Emrick couldn’t be happier that his milestone will be in Hockeytown, because about 40 of his friends and relatives, including his veterinarian and his accountant, will get to celebrate the achievement with him in person. “It just worked out that way,” said Emrick, who lives with his wife, Joyce, in St. Clair, Michigan, which is northeast of Detroit. “I told my wife about 10 days ago, we planned this day last summer. And I thought, it’s going to be give-or-take, it’s going to be around 3,000 when the game is held, but it came right out on and you never would have thought that. It’ll be kind of a special night. The number of pro games that he has broadcast is about the equivalent of some 36 ½ NHL seasons — certainly a milestone that most announcers can only dream of reaching. But Emrick counts himself lucky that he made it over a thousand, especially after a bout with cancer 19 years ago. Although he said Monday will be more about the world-class players that will be on the ice than his own personal accomplishments, it’s still going to be quite a memorable night for him. Ken Daniels, who calls Wings’ games for FS Detroit, has Monday night off from his usual broadcasting duties, but will be filling in as PA announcer at JLA. “I actually get to announce that it’s Doc’s 3,000th game, and for me that means a lot,” Daniels said, “because when I came into the league, he was an inspiration. I heard him long before, I was a (Philadelphia) Flyers fan way back when he was working for the Flyers. Hockey has always been a passion for Emrick, who upon graduating from Manchester College in 1968, applied to every hockey team that he could find. His persistence paid off when in 1973 he landed a gig with the Port Huron (Michigan) Flags of the International Hockey League. 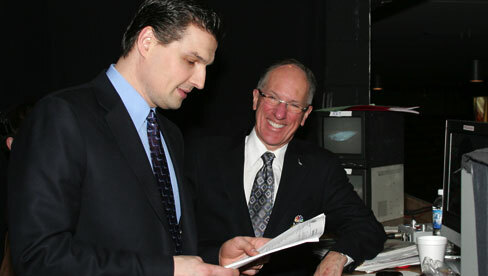 Some 37 years later, Emrick remains synonymous with the game, working as the voice of the New Jersey Devils, as well as the lead announcer for NBC and Versus, and for both men’s and women’s ice hockey at the 2010 Vancouver Winter Games. Emrick and his wife moved back to St. Clair in 1996 after the network that he was employed with didn’t mind where he lived, as long as he made it to the games in time. He’s reached over a million miles in the air, but wouldn’t have his situation any other way. The Red Wings will pay a special in-arena tribute to Doc Emrick during the third period of Monday’s game.